class="post-template-default single single-post postid-372512 single-format-standard group-blog masthead-fixed full-width singular wpb-js-composer js-comp-ver-5.7 vc_responsive"
By mid-morning, the stretch of Highway 71 from Gering to Kimball has re-opened; however the stretch from Kimball to the Colorado state line remains closed- as well as Scottsbluff to Crawford. Highway 29 from Mitchell to Harrison also re-opened by mid-morning. 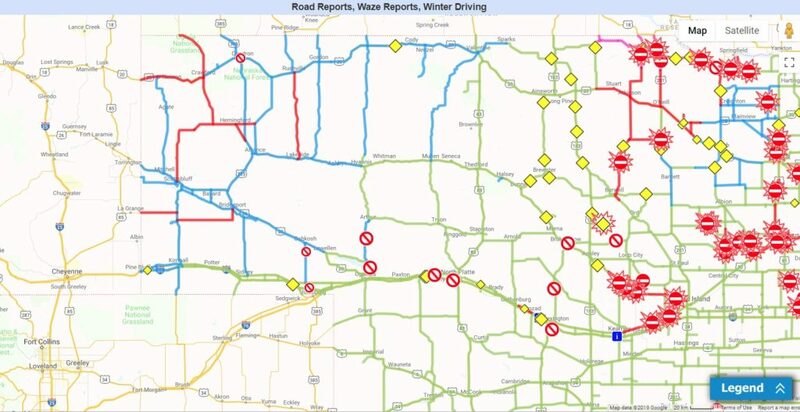 As of 10:30 a.m. Friday, all highways in the Panhandle are open WITH THE EXCEPTION OF: Highway 88, Highway 250, Highway 2 from Hemingford to the Highway 71 junction, and Highway 20 from Crawford to the Wyoming state line. Those highways remain closed.